…where was I? Oh yeah. Halloween. Well I don’t usually dress up, but seeing as I had a few parties to go to, I decided to try out my skill on a rag-doll costume. Presenting, Raggedy Ann! 1. 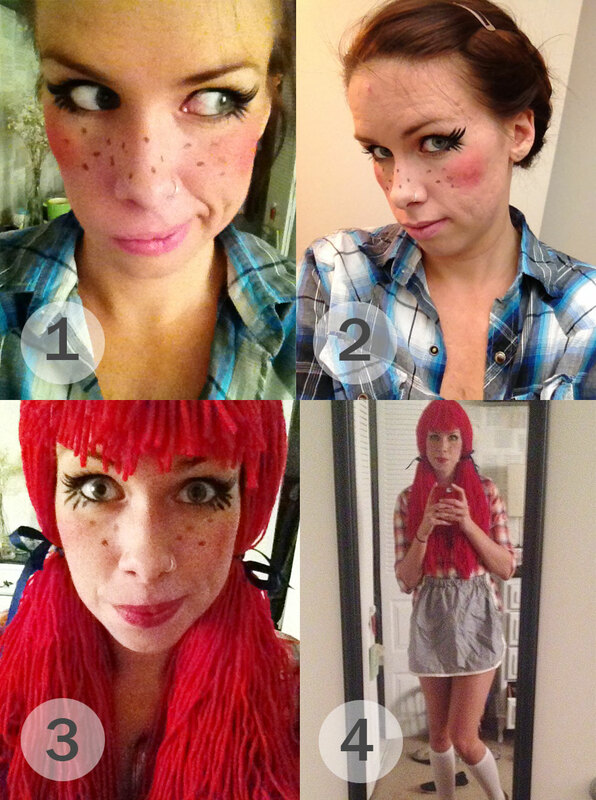 I did sort of an overstated “rag doll” look to make the eyes, cheeks and freckles pop under the wig. 2. Using a liquid liner proved to give the best control over the lash points. It also didn’t bleed through all the sweat of wearing basically a wool beanie on your head in South Florida so, I’m calling that a win. 3. I made (yeah, MADE) a reg wig using a tutorial from Katie over at A Beautiful Mess. Her stuff is amazing, seriously. Crafting genius people! 4. And there you have it! I paired it with a plaid top, striped shorts (I was going to ride in Critical Mass…yeah, biking in a costume. More on that later.) an apron, knee high socks, and converse. Boom, rag doll.